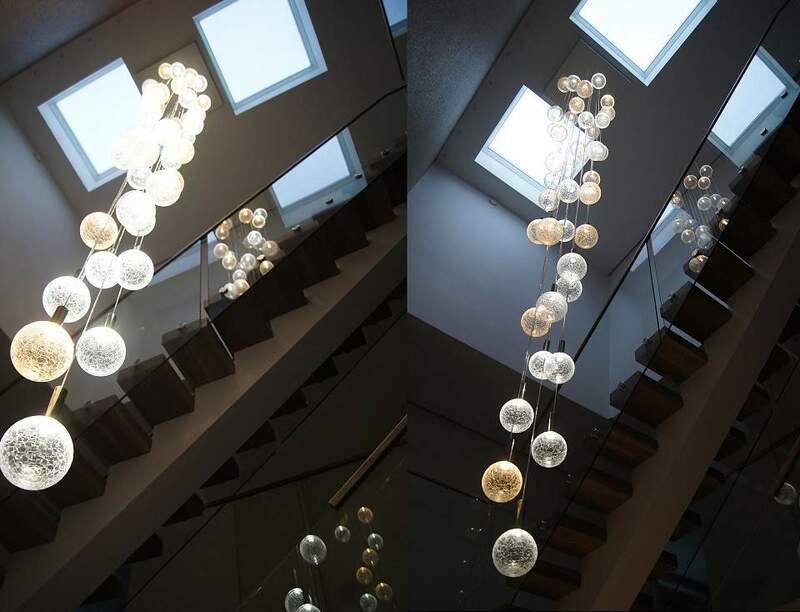 Due to the success of 'Elements' we are delighted to introduce a brand new variation called 'Crizzle' which utilises the same innovative integral LED lighting system as 'Elements'. 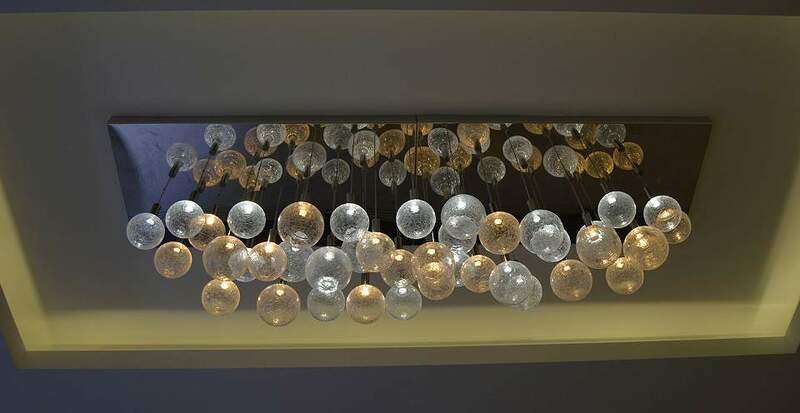 We unveiled 'Crizzle' at Grand Designs Live in May 2015, showing a chandelier that was populated with both warm and cool LEDs; this proved so popular that we have taken the majority of all new orders with both colours. 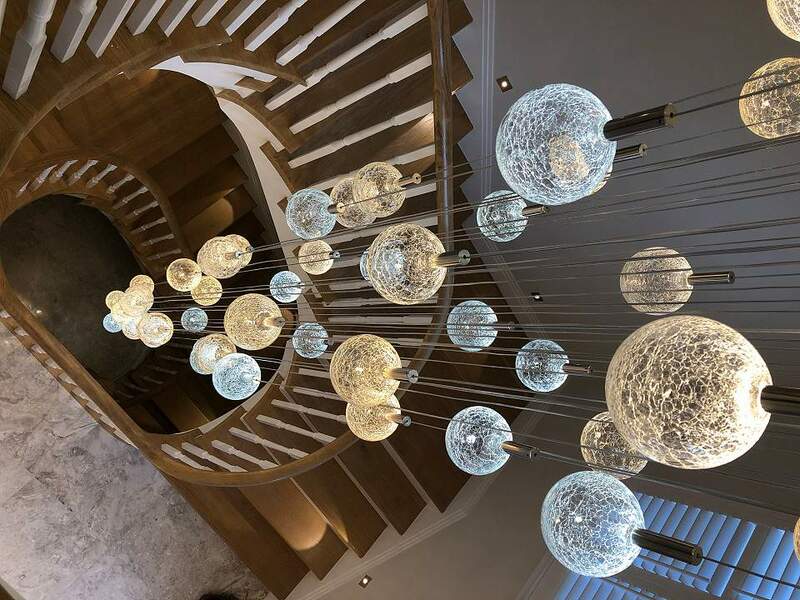 The Crizzle range is a design that literally fuses contemporary styling and traditional glass making process; The glass appears stressed and fragile while the production process ensures the integrity of the spherical forms. The 'Crizzle' Range. 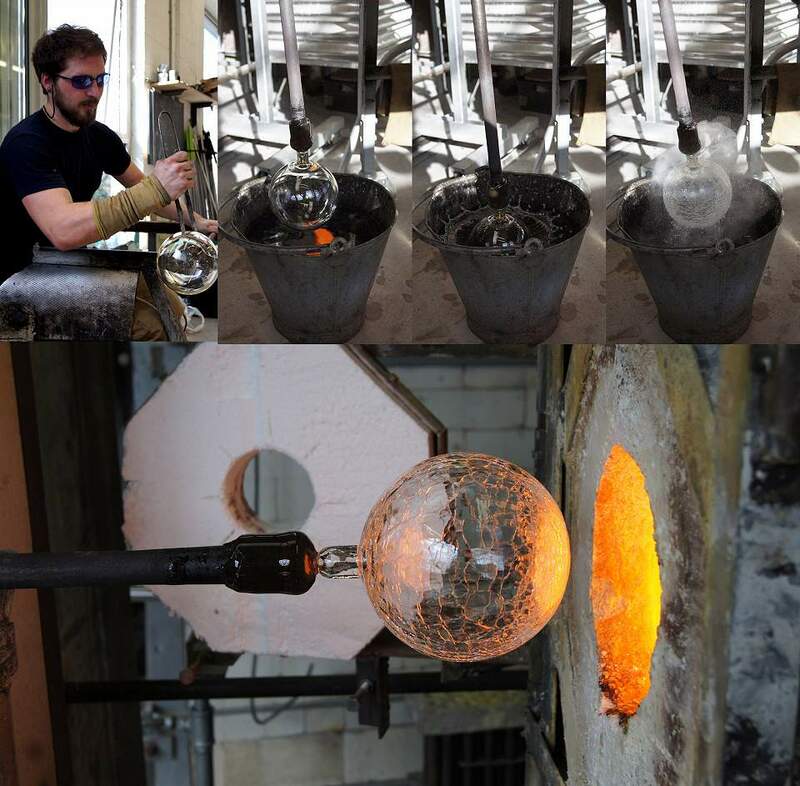 New for 2015, 'Crizzle' derives from a Roman technique, where you plunge the glass, still at around 950°c, into and out of cold water. 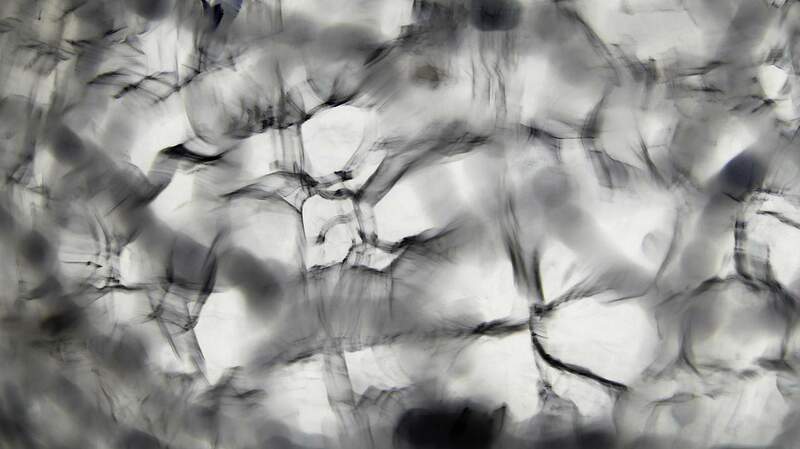 The Integrity of the glass is restored through several reheats. 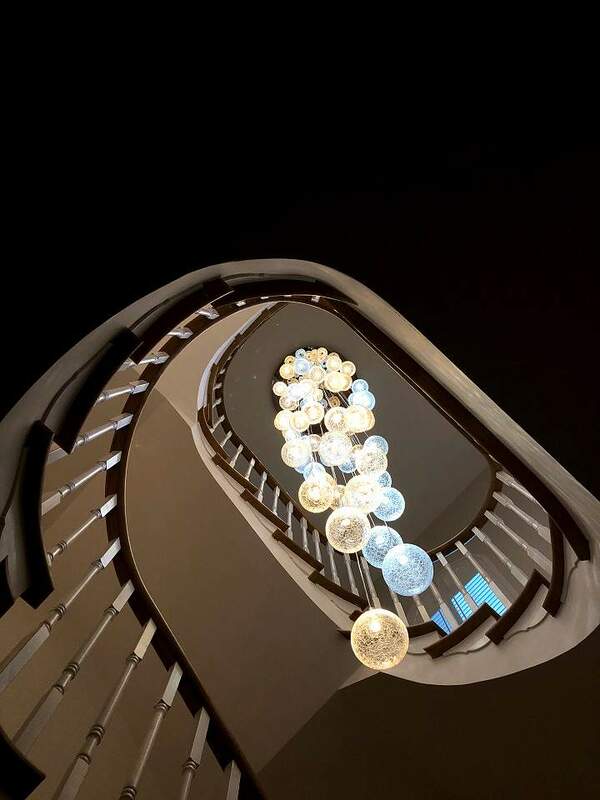 Typically we use three sizes in the 'Crizzle', these range from 100mm up to 150 mm diameter. 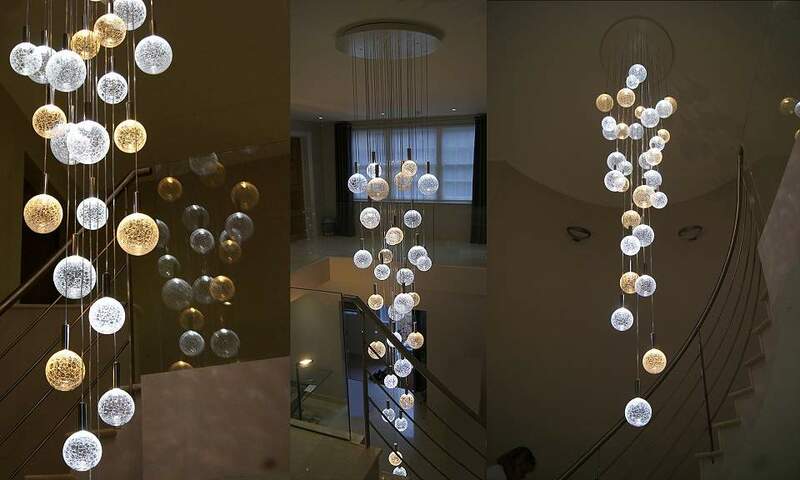 Produced for a client in London this Crizzle chandelier contains 31 Crizzle spheres, each with a diameter of between 110 and 140 mm diameter. 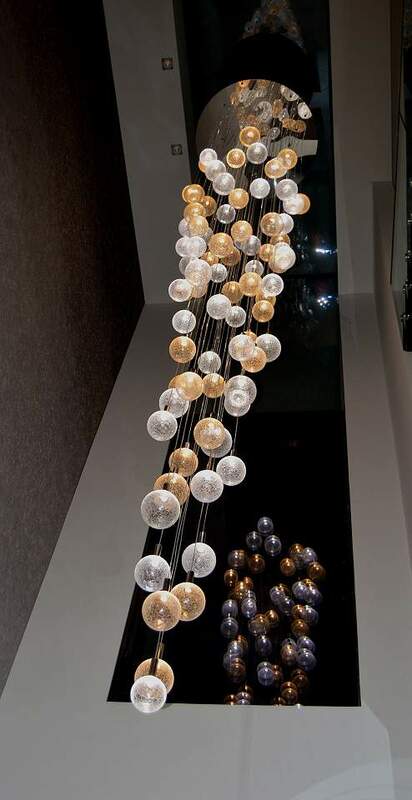 At 3.65m long this chandelier consumes just 35 watts. You can always specify a round top plate ; this one is a 750 mm diameter round plate which we make from a powder coated aluminium. 5 mm in thickness. 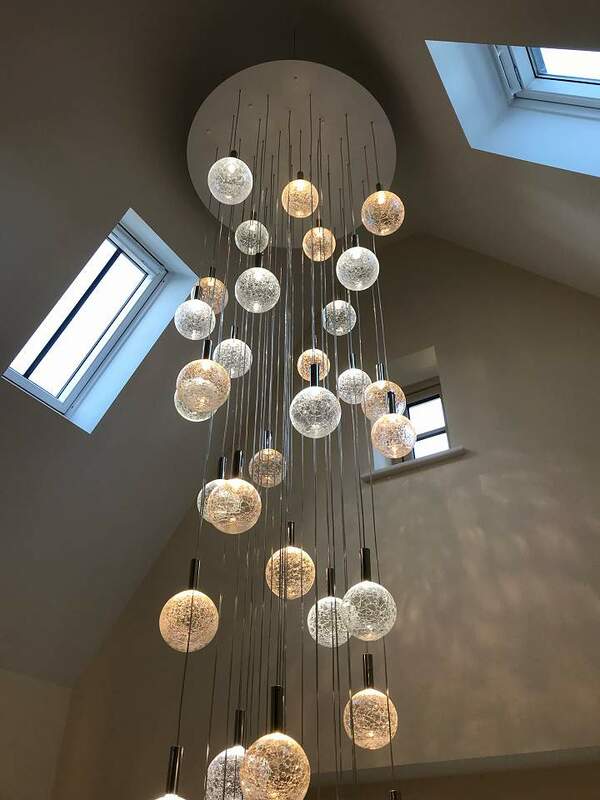 Produced for a client near Peterborough this Crizzle chandelier contains 27 Crizzle spheres, each with a diameter of between 100 and 130 mm diameter with a 750 mm diameter polished stainless steel top plate. 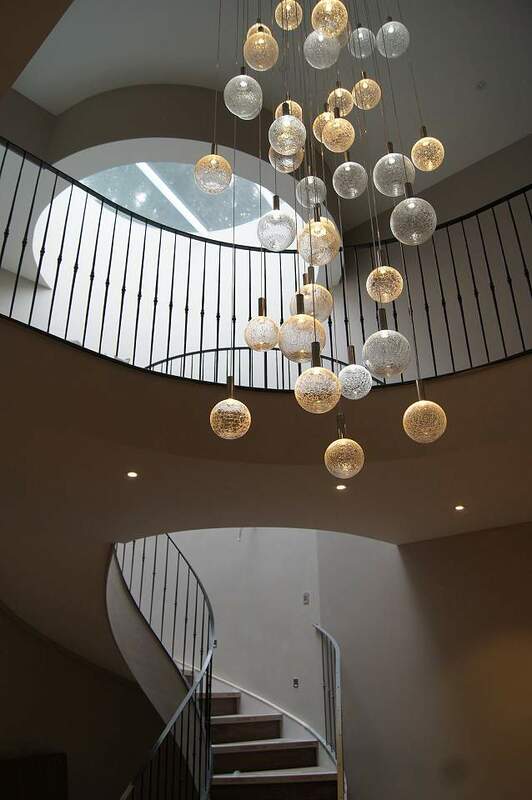 This commission worked well with the mirrored surface creating a focal point at the centre of both the specially built lit ceiling detail and the hallway itself. 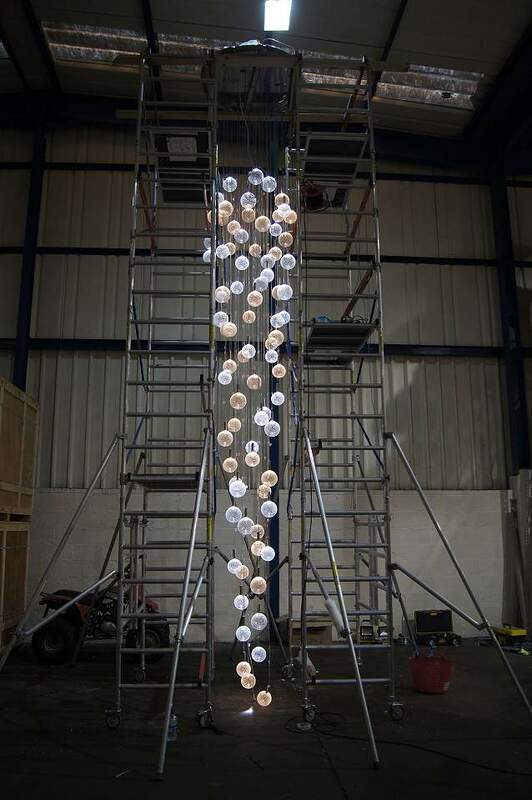 This commission contains 81 Crizzle spheres and measures just under 7m in length; this assembly stretched our resources at the Trench farm studio and so we borrowed a friends warehouse to assemble and test the chandelier. This commission is destined for a private client who resides on the Palm Jumeirah in Dubai. 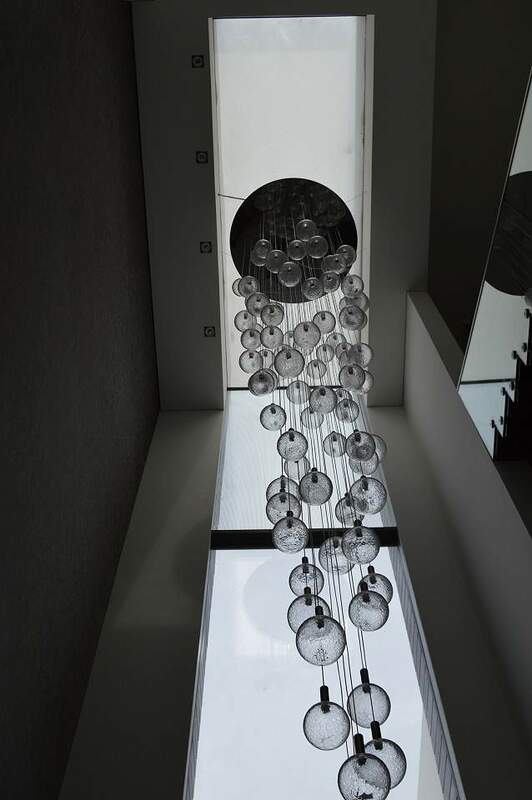 Here we see the same chandelier installed within a fine residence on the Palm Jumeirah, Dubai. 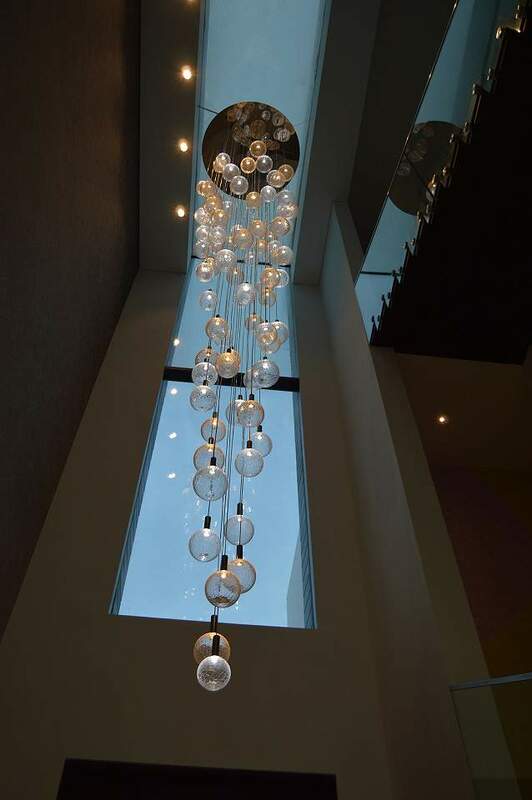 Suspended below and framed by an impressive sky light, this chandelier incorporates both warm and cool white LED's and a 1100mm diameter polished stainless steel top plate. 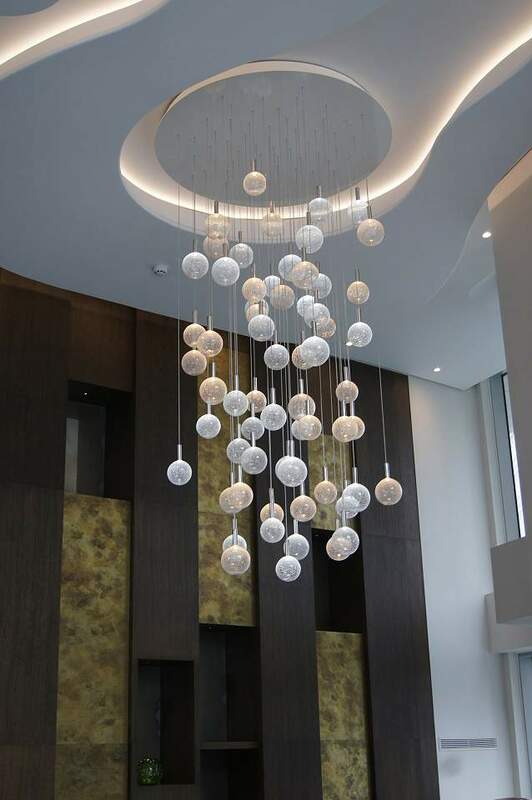 All our chandeliers are designed to look just as impressive in the daytime even when switched off. 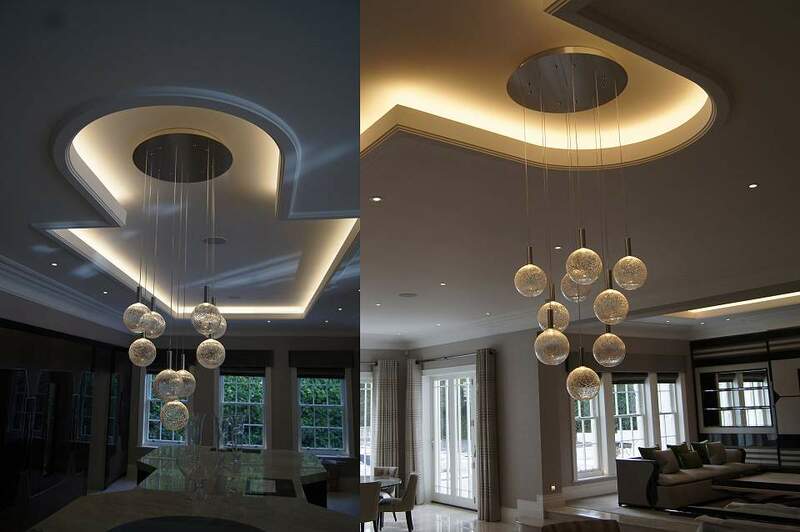 In the same residence the dining room is complimented with a matching ceiling mounted lighting feature above the table. 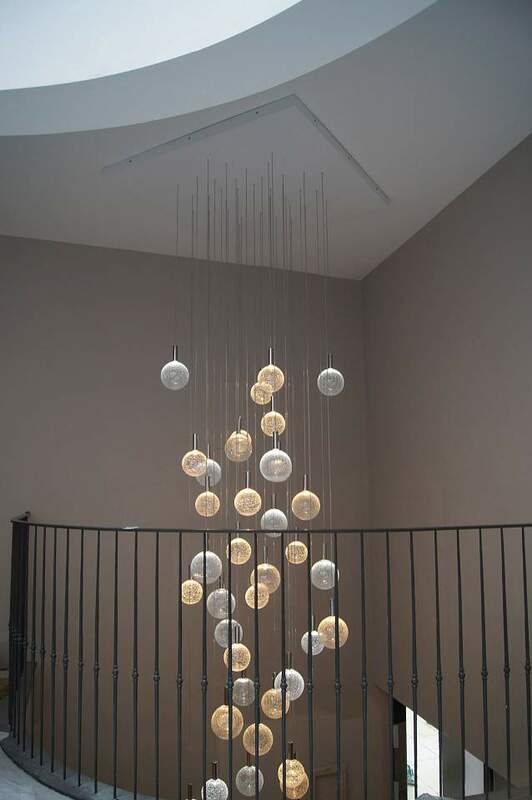 This contains 41 glass spheres suspended from a 2000 x 500 mm polished stainless steel top plate. 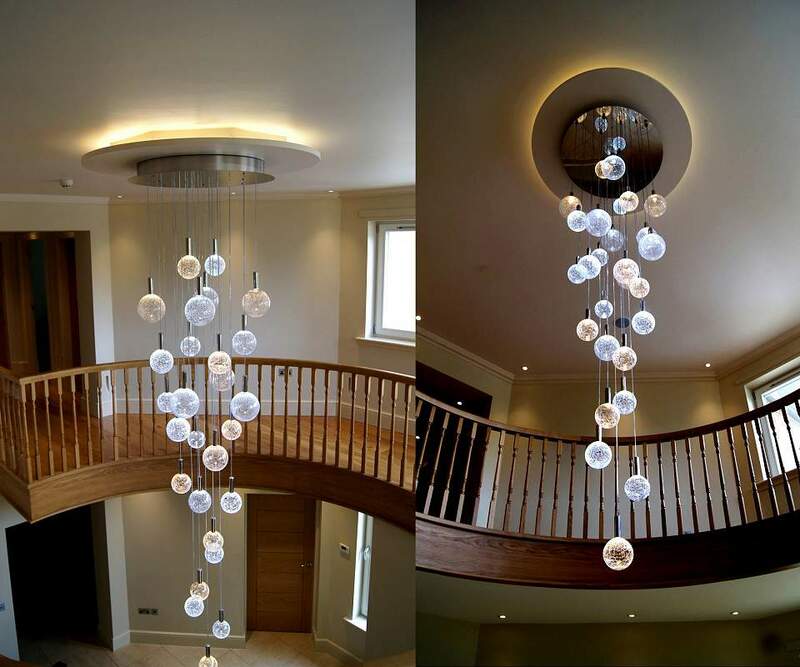 This Crizzle chandelier utilises a white painted MDF top plate to blend with the ceiling plaster work. 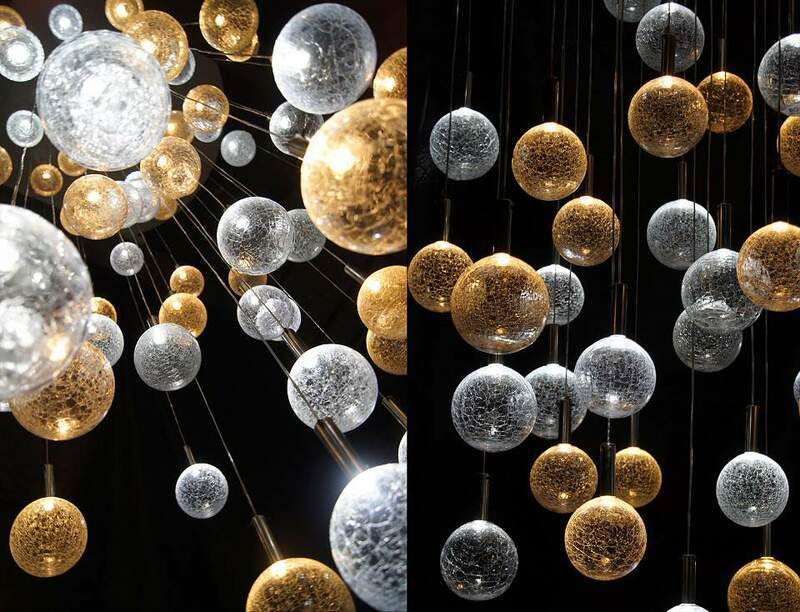 Comprising of 41 Crizzle glass spheres hung in a column form. 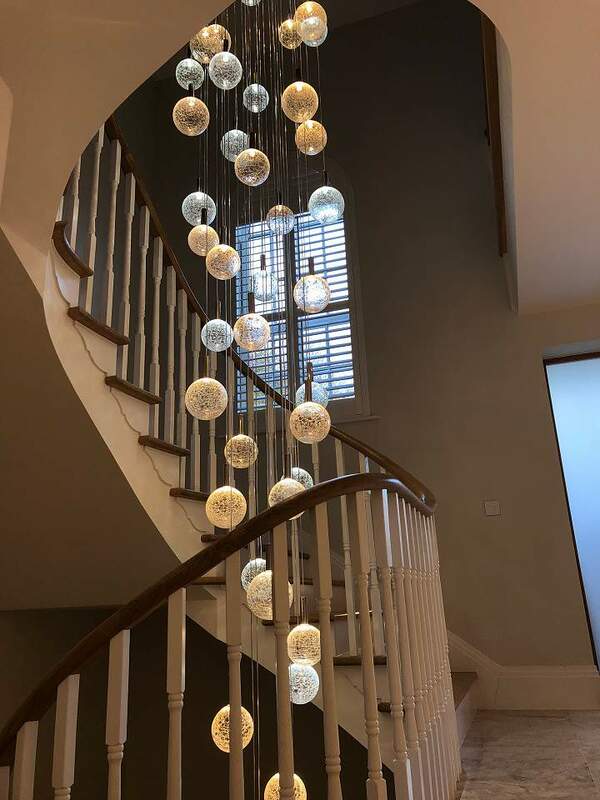 A small chandelier can really enhance a room - Applegate Homes in London commissioned this 9 ball light fitting - all done with 150 mm diameter spheres. This fitting had to be very slim to fit in between the two skylights. 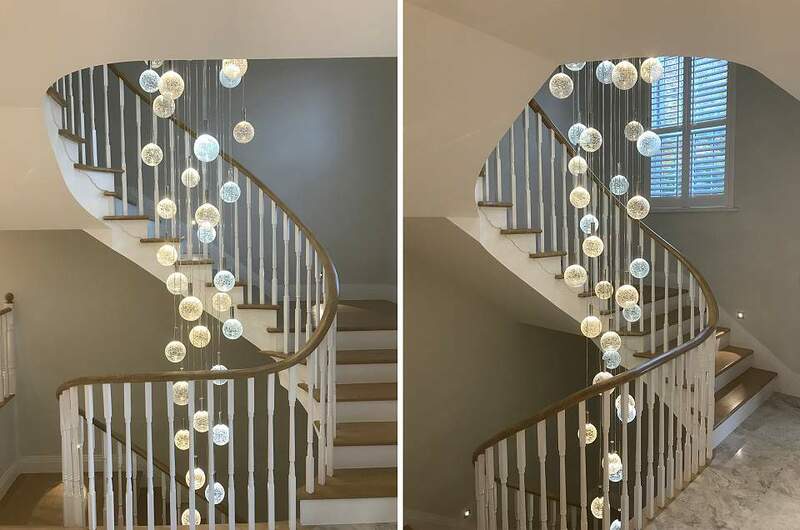 This London based client wanted a real feature down through 3 floors . We normally like to become involved on a New Build project on or before 'first fix' so that we can specify where the driver is situated. In this case there was no electrical supply available! 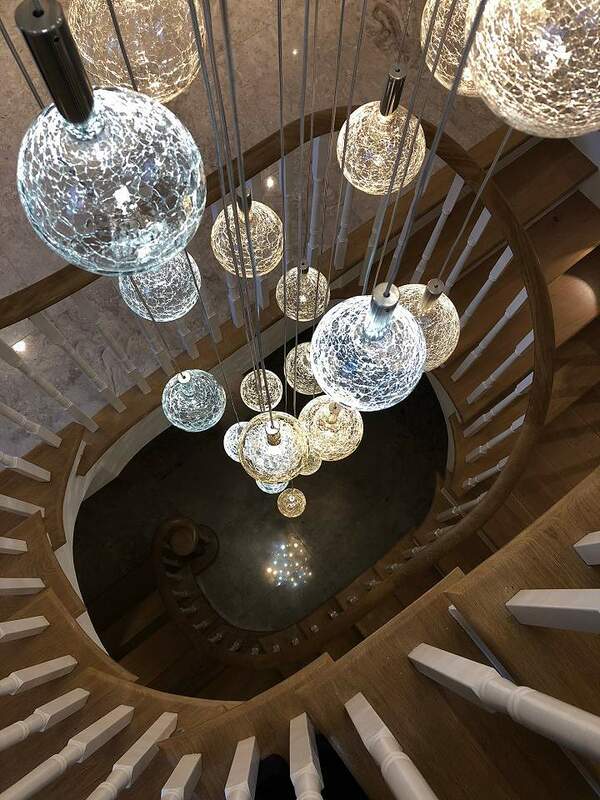 We normally like the driver to be isolated between the feed and the chandelier, just so, should the need arise in the future, it can be accessed and swopped out without taking the chandelier apart. In this case there was no electrical supply to the fitting what so ever; in the end we utilised a feed from the down lights and operated the on/off function via a remote controlled RF switch. We have just installed a large 53 sphere Crizzle in the atrium of a new Lifestyle Tower in Docklands - soon to open but as yet undisclosed. 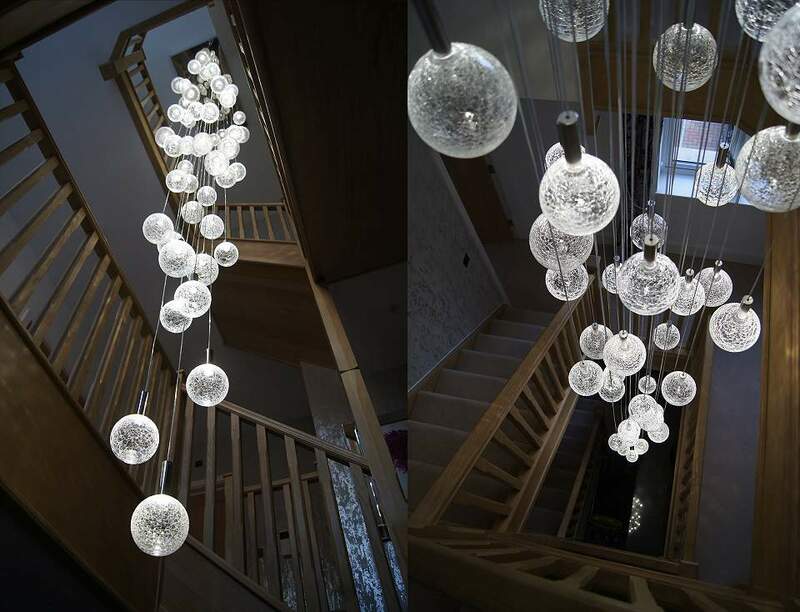 All our chandeliers are bespoke and made from scratch in the UK . 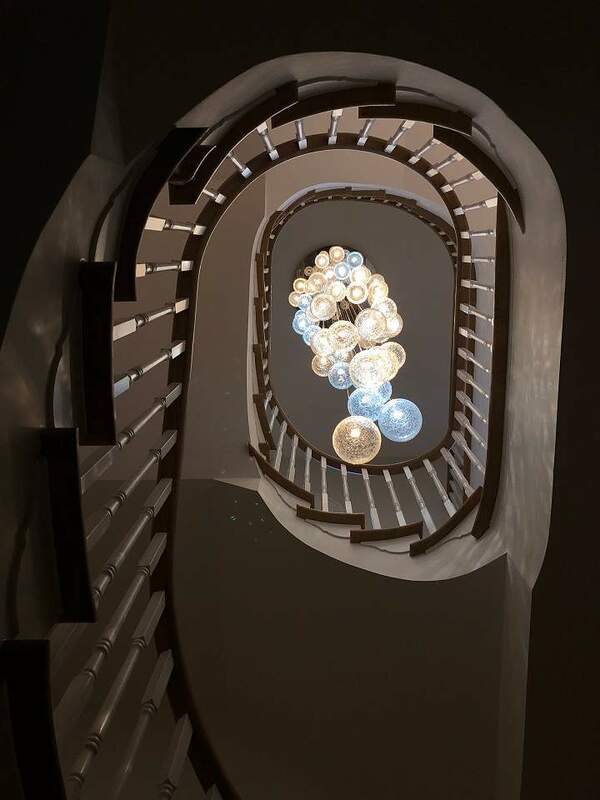 Specifying one of our chandeliers into a house often has to take into account non standard architecture; be it a sloped ceiling or tight apex .The interface between our chandelier and the building structure is often a major point of discussion and in 99% of cases we have a solution. In this installation we provided bespoke ceiling brackets that were fixed to the internal structure of the ceiling and used to drop 4 x 3mm wound stainless steel cables that then engaged with specially designed clutch tensioners fitted to the rear of the top plate. 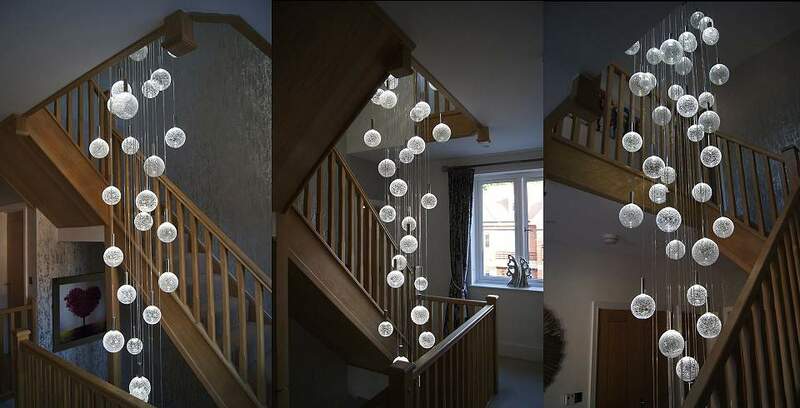 This image shows clearly the simplicity of our glass fittings. Each 'Crizzle' glass ball is glued into a polished stainless steel shank which in turn is fitted to the clear twin core cable and retained via a polished aluminium cap and two M5 stainless grub screws. This makes both the glass and LED replaceable with ease although in normal use the LED will last over 10 years. Page created in 1.636734 seconds.